You can now purchase, print and use on demand at your event! We heard your requests and have taken heed! The next mobile iteration of the SCANTrivia platform is here and ready for you to experience. INBs On Demand! Now you can purchase, print and have your badges on-site ready for your attendees to use on demand. Once you have placed an order through our website our team will send you a PDF file of your badges that can be printed by your choice vendor or by using one of the Avery templates listed below. Then on site, insert your INBs into the back of your badge holder for attendees to scan and claim when they receive their regular event credentials. That easy! 2 Engagement Types to Choose for your Attendees! Have fun with our standard SCANTriviva platform by allowing your attendees to create a trivia question about themselves. If you have an energetic audience that wants to have lots of fun during the event, try out our 2 Truths and a Lie platform! 2 Truths and a Lie is the ultimate ice-breaker for any event as it creates a great segue into fun or meaningful conversations. 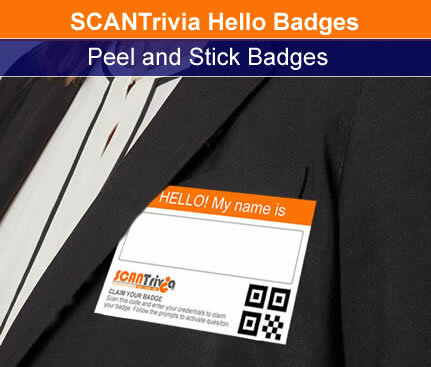 SCANTrivia Badge Inserts make it easy to add gamification to your event without system integration. Just insert our INBs into the back of your badge holder and your attendees can claim them on site in a matter of minutes. Attendees can either use the QR code reader in your event app or download the free SCANTrivia Gamification App. Get started by picking one of our SCANTrivia badge types and the amount you need for your event. Once your payment has been processed we will send you a PDF file of all your INBs. You can then print your badges whenever you like. During your event each attendee can claim their badge by simply scanning the QR code and following the prompts to create their question. Once attendees claim their badge and create their trivia question or 2 truths and a lie, they are then able to scan other participant’s badges and earn points. Q: How much do the badges cost? Q: How long does it take to turn-around the badges? A: It takes 24 hours from the time of processing to receive your badges. Q: How will my badges be sent to me? A: Your badges will be zipped as a PDF file and emailed to the address indicated in your order form. Q: Which Avery template do I use for my badges? Q: If I have left over badges can I use them for another event? A: Currently our platform configures badges by event. Therefore, unclaimed badges cannot be used for future events. Q: Can I order more badges for the current event if I need to? A: Yes, just keep in mind that there is a 12 hour turn-around for processing. If your event requires custom badges or attendee import for a faster online claiming process, please click here and complete our inquiry form.